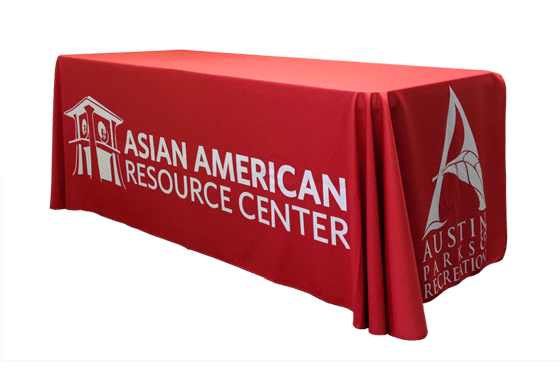 Choose from hundreds of colors or custom design your own Table Cloths or Table Runners with your company’s Pantone colors. 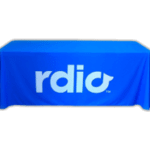 Like most of our other products, our Table Covers are machine washable, light weight, wrinkle resistant and are made with Tested & Approved Fire Retardant Fabrics. 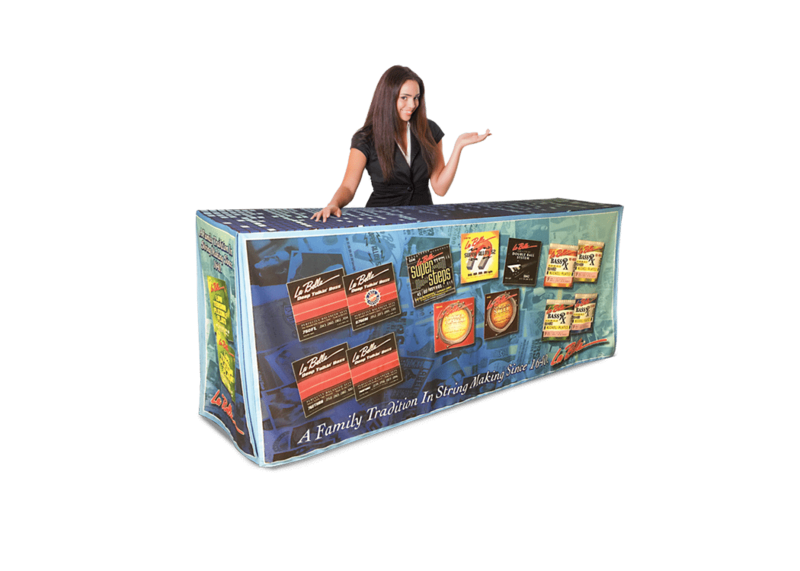 Giant Printing can help you get the attention you deserve! 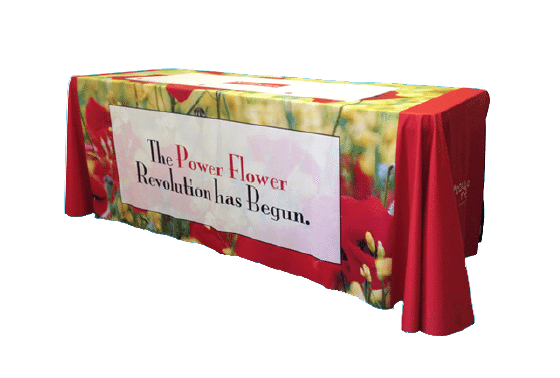 Trade Show Table Cloths are the first iconic piece your prospect sees out front competing for their attention. They’re going to decide in that instant to keep on walking or talk to you. 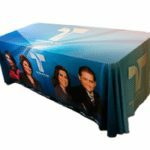 Our Custom Printed Bar Height Table Covers can transform your table into a billboard. Potential customers will walk down the aisle, and the first thing they see is your table. Grab their attention right away with a striking graphic or bold call to action message. 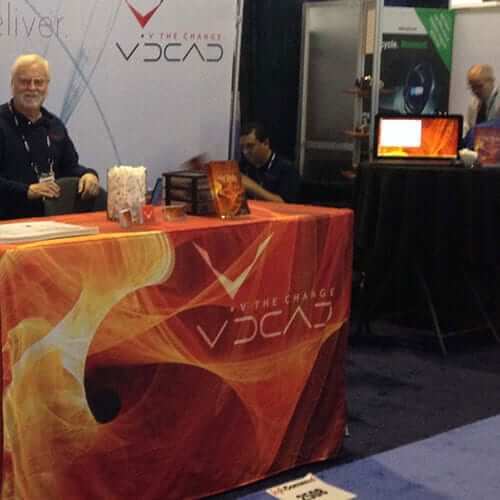 These covers are custom made to fit any 4’, 6’ or 8’ trade show table. 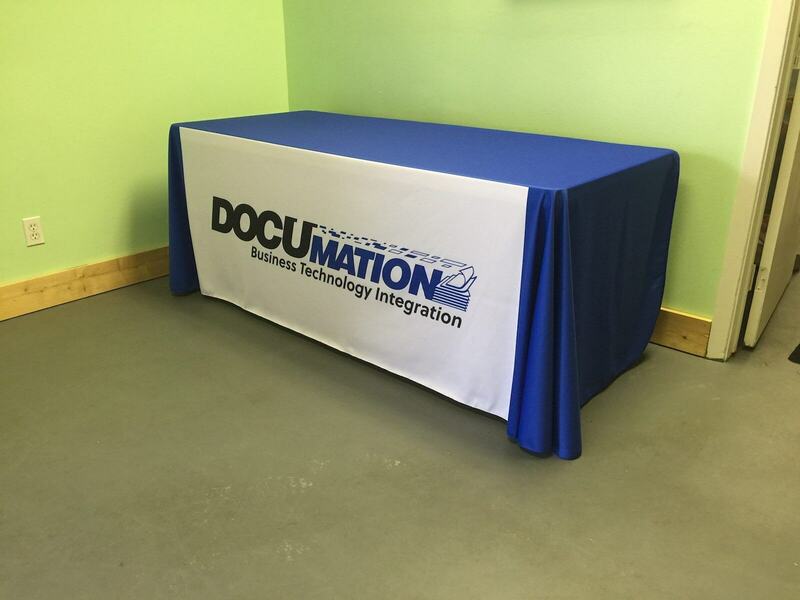 If you only want to cover the front side of your table, we can make you a custom Table Wrap with sewn-on Velcro. 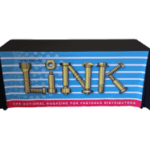 Tested & Approved Fire Retardant Table Covers! 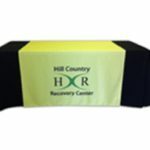 Our Table Cloths and Table Runners can be sized to fit any table. With our expandable print area, you can put your company’s product, logo or message on the front, top and both sides. 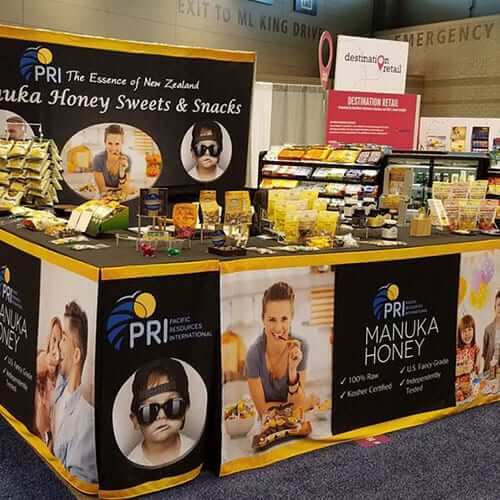 Giant Printing’s 2-step printing process produces the highest quality image transfer for the absolute best Trade Show Table Cloths and Table Runners. Quality is always guaranteed with Giant Printing! Once you cross that threshold of having a worn out Tablecloth with cracked printing, it reflects on you and your products. All of our covers are machine washable. Multi-Color Logo on Any Custom Color. Logo on Multiple Custom Colors. Product and/or Logo on Any Photography or Color Combo. Product and/or Logo on Front Only. Logo on White or Any Custom Color. Custom Made for Any Bar Height Table. 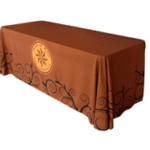 The best table covers start with fire-resistant polyester-based fabric. 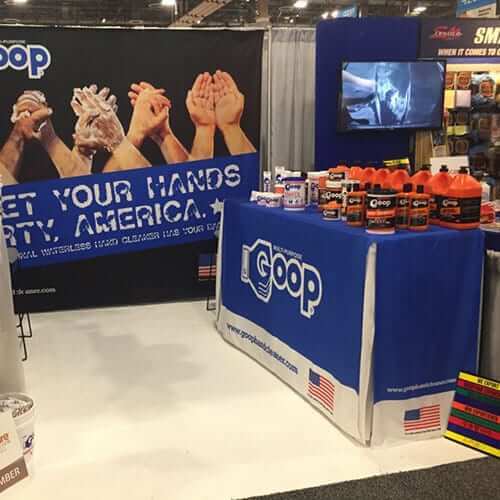 When it comes to Trade Show Table Cloths or Table Runners, some fixate on price and go with “off the shelf colors” or what is referred to as random colored fabrics or inks that cause chipping and peeling. Tablecloths are no place to cut corners. like most of our other products, are machine washable, light weight, wrinkle resistant and fire retardant. 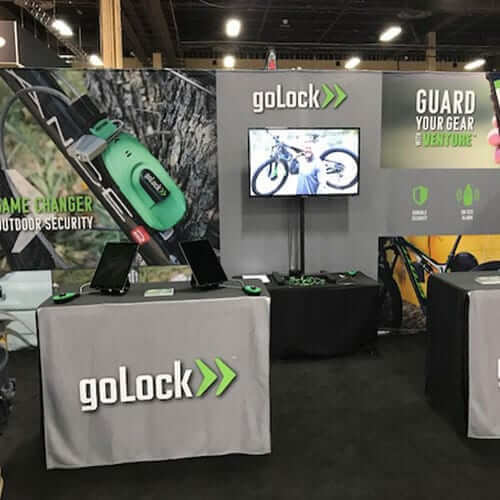 Whether you call it Table Covers, Throws, Skirts, Runners or Tablecloths, your prospect’s first impression is the reflection of this investment you’ll make. 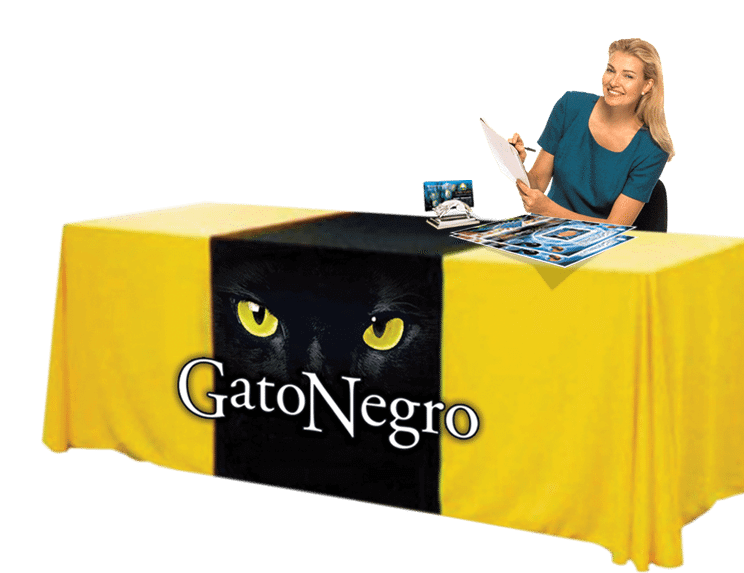 View our Custom Printed Table Covers Gallery. Everyone loves how great it Table Skirt turned out!! I just received the Pantone Table Throw this morning and it looks great! 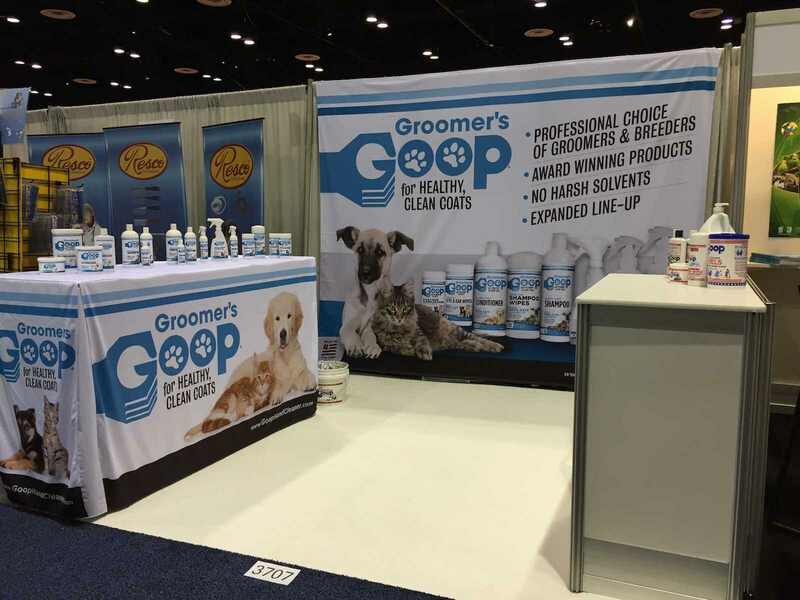 We love the fabric banner – it got here just before the hurricane hit. The quality of the print is outstanding and the way you set up the Velcro worked perfectly. The Pantone Table Runner was perfect. You all did such a good job and it’s just what we wanted/needed. Thanks so much. Thanks Lindsay for the Premium Table Throws! It’s a pleasure working with you guys as always. 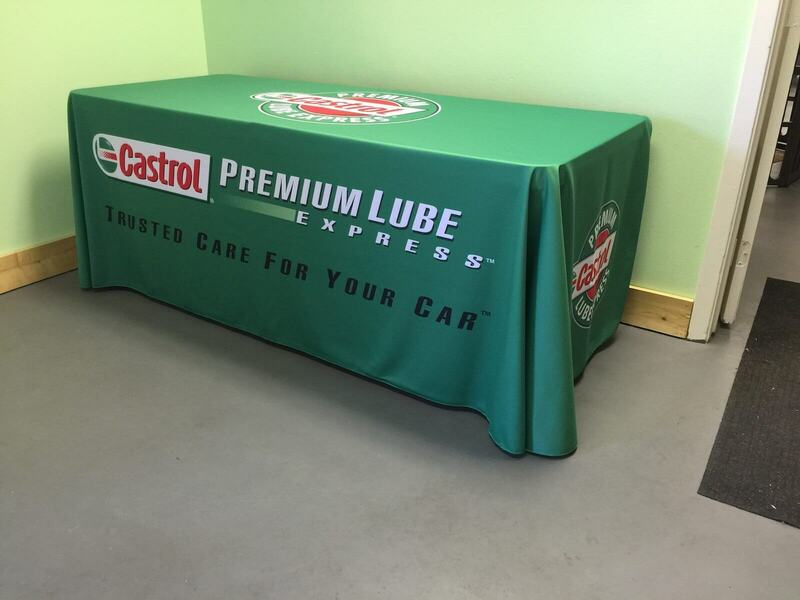 Our retail facility got the table cover and they said it’s exactly what they were looking for, so thanks again for getting that taken care of us!! !